With a coat of chalkboard paint, we made the inside of the garden shed door a functioning sign board. It's true, we have all these veggies and fruits listed. While they may not be ready yet, they are technically growing. Let's have a little before-and after-fun. This is what the vegetable garden looked like before Facilities Manager cleared and plowed the land. This photo was taken last summer. Here is the vegetable garden as it looked last week. The top half of this part of the garden is orchard and the bottom half is primarily vegetables. The row covers are currently in place to protect cabbage, broccoli and cauliflower from pests (we've had a little problem with the dreaded cabbage moths). The rows above it are planted with corn, beans, cucumbers, beets and carrots. This photo is from fall 2015. Exact same spot last summer after FM started tackling blackberries and dead trees. Here is how it looks today. No paths yet, but it's on its way. One day last weekend we planted the following in this area (and to the left, out of sight of this photo): 11 gooseberries, 10 asparagus, 9 strawberries, 8 blueberries, 7 raspberries, 6 chives, and a couple of artichokes and rhubarbs. And no, I did not plan it to sound like a Christmas carol. I'm just weird that way. FM here: We have three hens, two cats and one facilities manager! Very strange! Again, the scene last summer after a few weeks of blackberry clearing by FM. Same area last week. We moved three of the old raised beds that temporarily held our bare-root fruit trees and lettuce all last winter to this area for permanent strawberry, lettuce and herb boxes. Oh....I remember when it looked like this when we bought the property. We were so excited that we completely overlooked being overwhelmed. This is the general view as it looks today. The gravel path marks the division between the orchard, to the left, and the veggie garden, to the right. It will eventually continue on, ending at the property line/fence just visible beyond. 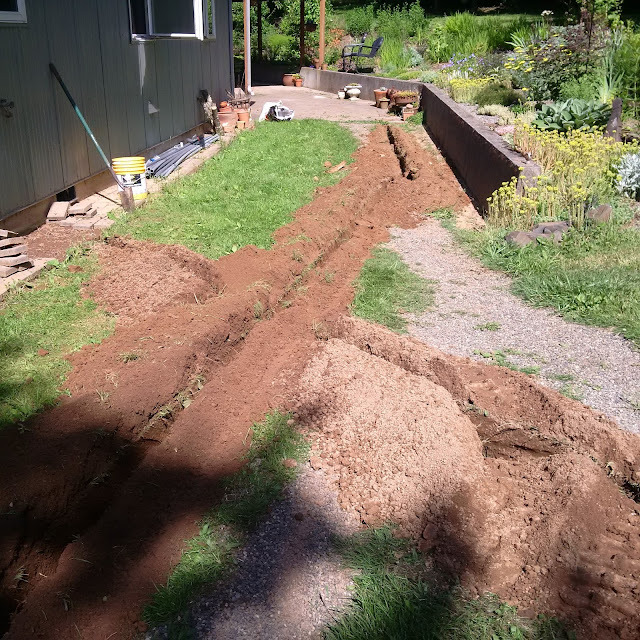 The fence on the right encloses the veggie garden (from prying destructo-chicken feet); it will be moved over a few feet in the fall to make the path a few feet wider. Here's the direct-sown corn, beans and whatnot with a top row of giant sunflowers. The design and look of this area will change in time, of course, as we continue to improve and work the soil with compost and other amendments recommended by Logan Labs where I had the soil tested. It will probably become more level as we work it every year, but for now we wanted to get the garden started, so it is a bit on the raw and lumpy side. The small bed is strawberries, the larger one in back is for greens and lettuces, the one on the right is for herbs such as fennel, parsley, basil, tarragon and chives (planted at the base of the bed so they don't take over). FM sowed red clover seed as a cover crop to the remainder of this half of the veggie garden as it's not been completely planted this year. That's what you see growing in green patches all around. The rows of corn and the like are just outside of this shot to the left. How shall we provide water to the far corners of the property, you ask? I'm glad to tell you that FM rented a trencher last week in preparation for irrigation pipes. In this shot, the line from the house has been dug past the chicken coop. FM says no he was not drinking during this process. He says always blame the machinery. From there he turned it south, halfway between the garden with two faucets in this area. There is a third at the top of this photo for the eventual hoop house (that's another phase, another day). FM says it will mean not having to drag two or three hoses around the property, an activity that wears out the arms and can damage innocent plant life in the path of dragged hosiery. 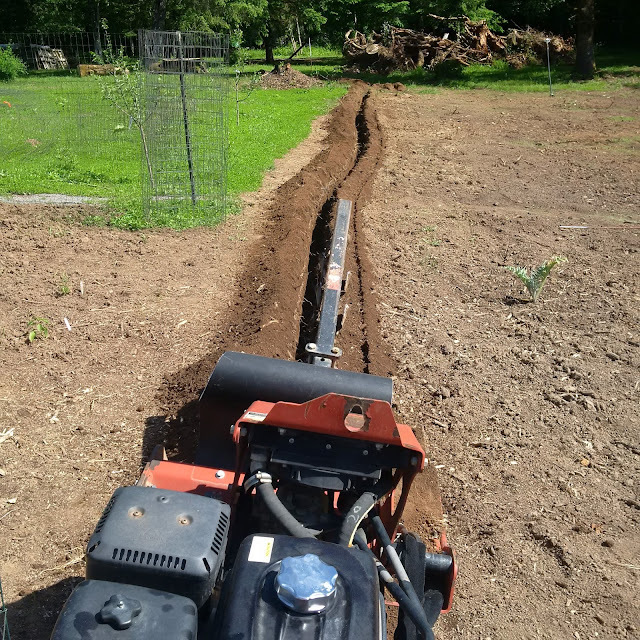 In addition to the irrigation ditches, FM dug this channel along the north side of the house to aid in water-runoff management in the winter time. That retaining wall prevents water in the berm garden (to the right) from draining and it all ponds in that flat grassy area and becomes a boggy, muddy mess. By directing the water out via a channel outlet and a lot of gravel, we are sure this area will be drier in the winter months. Plus, FM continues to refine his shoveling skills. Whew! 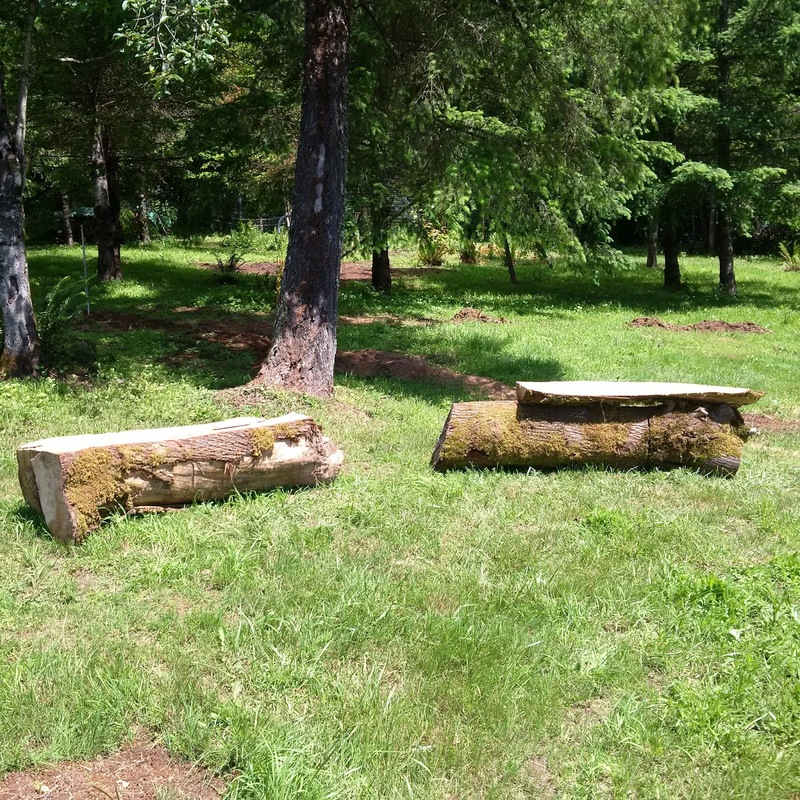 FM decided to keep the trunks of two maple trees he cut down. He made lovely simple benches for us to enjoy the view from the top of the orchard looking south over the food garden. Yes, the slab on the right bench is the top of the left bench. Both benches are comfortable, but they need to be finished with a varnish or sealant before -- dare I say it? -- before the rains return this Fall. I leave you with a parting shot of Doug, or resident native Douglas squirrel (also know as a "pine squirrel"). There are dozens of other large Eastern gray and fox squirrels around, those somewhat annoying imports that have squeezed out our native critters. So it was particularly delightful to find these much smaller and surprisingly tame native squirrels suddenly show up the other day. So tame, in fact, Doug crawled up onto my boot and looked me in the eye. No kidding. We also have a native chipmunk who hangs around from time to time, it's a thrill to live among all of this wildlife. FM, who is an English major, says the collective pronoun for a number or group of squirrels is a "dray" or a "scurry" of squirrels. Of the two words, we prefer scurry. So now Doug has a last name. Douglas Scurry. That is Mr. Scurry to you! As we continue to work on the Final Frontier of our garden, (otherwise known as the food garden), it often occurs to me how lucky we are. We have this wonderful land, plants, chickens, wildlife, cats and each other. Really, what more do we need? It's the adventure of a lifetime....I have to pinch myself sometimes so I'm sure we're actually doing it. I look forward to watching the apple trees grow and gathering blueberries from the field. I enjoy watching plants take over, change, even die as they live out their life cycle. It's a wonderful life and I'm glad to share it with you all. That's it for this week at Chickadee Gardens. Thank you so much for reading and commenting and until next time, happy gardening! I always love reading your posts. The amount you've accomplished in such a short time in nothing short of amazing! Thank you Joanna! I appreciate that and am glad you love reading what we've been up to. Those irrigation trenches do zig and zag a bit, don't they? FM needs to lay off the sauce, LOL. J/K, I wouldn't want to have to manhandle that big piece of equipment. I think I would have opted for alliteration and called the squirrel Douglas Dray. But Scurry is descriptive. I hope you have some food preserving skills, you are going to eventually need them. Ha ha...YES HE DOES need to lay off the sauce.... I'm glad I don't have to do it either, Alison. That was one crazy piece of machinery as every piece he's rented has proven to have been. I like your name, I'll let you and FM wrestle it out on that one. Funny you should say that about food preserving skills, we were just talking about that. Next project, canning 101. Every one of your posts is a revelation. You've done SO MUCH already! I'm exhausted just viewing the photos. Oh, don't be exhausted! We've done all the work for you ;) You're too kind, Kris. It's exciting to see it develop and that, my friend, is just one of the pay-offs. Now off to the hot soaking bathtub I go. After a bottle of ibuprofen. For a second I thought the trencher cut the bench in half! ;) So much space -- I think that's really the only way to grow food successfully. Small gardens tucked into tiny spaces end up just disappointing in my experience. Ha ha...Alan, that is funny! I totally see it - the bench cut in half by the trencher. Small gardens are all I've ever had and have never had good luck with veggies or fruits, they need sunshine and good air circulation, something the home gardener cannot easily give up when cramscaping (as I am most guilty of). There's no room for air circulation with 42 plants in a square foot! Ha ha...OY. It's true. Amazing! You're living the dream of us small space urban gardeners. You are fortunate, indeed to have all that beautiful space and each other. You both have an admirable amount of energy and a great vision to take on such a project. Impressive! I kind of am living the dream, Peter. Thank you for your kind words and encouragement! Work work work...but also FUN! Big fun. Can't wait for the garden update post when it's all lush and producing bucket fulls, not that is issnt already lovely. Oh yes, tons of fun. We wouldn't do it if we didn't love it. When the farm stand opens, I'll let you know! We have two (at least) Dougs living here. They are so cute but I miss the chipmunks who have apparently gone somewhere else to raise their young. Your gardens look amazing. I am so glad you're having fun on the farm. OH, they are so cute those Douglas squirrels and chipmunks both. Great you have them too! I love your posts, and I'm amazed and impressed with all the work you and the FM get done. Thank you Patricia! And as I mentioned before, do come out for a visit! We'd love to see you! The IKEA solar pear lights up our deck at night and I think of you every time I look at it. i love before and after. congratulations. 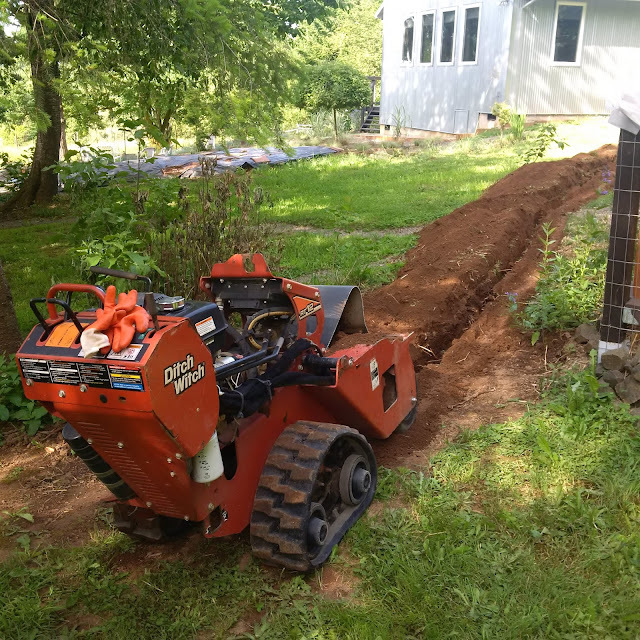 we have had a lot of mole activity this spring and the trencher you rented makes me think of a very very large efficient mole. Thank you Dramagarden! That's funny - it is like a GINORMOUS mole. Hee hee..love it! Thank you for the comments and kind words!